“I hope they take that child away,’’ she said. “He’s not safe. She [Nichelle] needs to be a better mother. He’s supposed to be safe in his own home.“He’s overcome a lot, but I think it’s time for her to get into trouble. I’m not sorry for her. 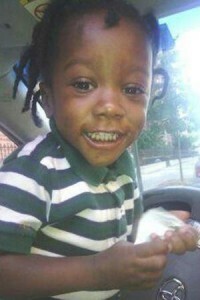 I’m sorry for the baby.” Fleming said the pit bull who attacked Tharell belonged to his mom’s boyfriend at the time. New York Post reports a 3-year-old Brooklyn boy still recovering from a vicious pit-bull attack only two months ago was fighting for his life again after he was shot in the head as he slept in his crib yesterday. Akeem Bernard, 22, a family acquaintance with a record of at least six arrests – including one for weapons possession – was charged last night with assault, endangering the welfare of a child and criminal possession of a weapon. Tharell Edward was in critical, but stable condition at New York Hospital. He has overcome much in his short, sad life. Tharell was born prematurely to a woman who neighbors say spent most of her time ignoring him. His dad, they said, was never in the picture. The mom, Nichelle Edward, 43, left him Friday night in the care of a woman who neighbors said was her roommate. The roommate, who was not identified, then invited Bernard to join her in the Ditmas Park apartment. The woman told police she heard gunfire at about 3:30 a.m. yesterday. Bernard told cops he carried the boy to her. He claimed the bullets were fired from outside – but cops said the only holes they found were in his story and not in the windows. The weapon was not found, and authorities also charged him with tampering with evidence for allegedly getting rid of it. Bernard quickly lawyered up – and did not make statements. The circumstances of the shooting were unclear, and a source said cops had no reason to believe it was not an accident. This kid really has a rough start in young life!